There isn’t anything pretty about addiction. A disease of the mind that carries with it, if it could be summed up in one word—loss. The list of virtues the condition can strip from an individual is incredibly long; Authenticity, Self-Respect, Dignity, Commitment, Responsibility and Accountability are several examples. A lot of addiction recovery, on the other hand, is a return to probity. When the smoky haze of intoxication recedes from one's brain while in treatment, one can begin to reconnect with what one values most about themselves. The side of your soul that your friends and family loved about you before the death spiral of addiction took its course—attributes which drugs and alcohol stole from you on the short or long road to self-destruction. Recovery is a difficult process on various levels. It requires you to take a close look at things that are painful. In order to recover, one must walk back up a snow blanketed mountain of wreckage that the avalanche of addiction left in ruins. And to chart a path to the summit where the sunlight of the spirit can once again shine upon you, help is required. Assistance from others who have made the trek before, but know if they do not go back down and guide others then they cannot keep their place at the top. Obstacles will be a part of the journey, but with support and commitment to be honest with yourself and others, one can prevail. A key component to addiction recovery is opening one’s eyes and mind, taking a telescopic look at the damage done. Aside for that incurred on one’s self. The wreckage of years of dishonesty and a lack of accountability. Many people consider what their disease took from them early on in recovery; loss of career, home, financial security and any number of personal possessions. Certainly, those losses when added up will leave a bad taste in anyone's mouth; however, the most painful deficits and hardest to get back are the relationships. Substance use devoids a person of partners, friends and most importantly family. To take it one painful step further—their children. The list of people harmed by your addiction will likely vary in length, depending on how many years were defined by alcohol and drug abuse, but even a short list can be daunting to address. What’s more, some amends cannot be made in words, only by one’s visible action after having made a commitment to honesty, accountability and responsibility for one’s actions. Time to put metaphors aside. As you well know, we have been in a stranglehold of an epidemic for two-decades. The result of an over-reliance on prescription opioid painkillers for all things pain (and not) and a scourge of heroin abuse that is arguably a byproduct of rampant painkiller abuse. The media is mostly fixated, and for good reason, on overdose death rates and a serious lack of resources to help addicts find recovery. But there is an even darker side, or heavier cost to millions of Americans abusing opioids, children who for all intents and purposes are castaways in the sea of epidemia. Generations of children and teenagers growing up without one or both parents, to be raised by relatives or worse—the State. 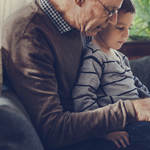 The findings from the 2015 U.S. Census Bureau showed that there are 2.7 million grandparents and other relatives raising grandchildren in America and 430,000 in foster care. To be sure, not every one of those kids are wards of people other than their parents because of opioid addiction, but there are many who believe that there has been a serious increase, because of rampant abuse across the country. Anecdotal evidence certainly supports such claims, according to CNN. School administrators in the State of Kentucky have witnessed a steady increase of grandparents or other relatives seeking social services and counseling for kids who lost parents to opioid addiction. Grandparents, who just a decade ago would have said that retirement was a forgone conclusion regarding their golden years, are thinking again. In some cases, grandparents are raising multiple children. Sandra and Michael Flynn of Kentucky are two grandparents who have found that to be the case, when the state asked if they would assume custody of their daughters five, yes five, children ages 16 down to 6, the article reports. The Flynn’s have been permanent custodians for the last six years, assuming guardianship just after their daughter gave birth to twins. "They were born addicted," said Sandra. Likely referring to the condition known as neonatal abstinence syndrome (NAS) i.e., acute opioid withdrawal. While the Sandra and Michael have reservations, they have begun the process of arranging with the court to allow “strict, supervised visits” contingent on passing drug tests. One must remember that most of the children are likely too young to comprehend the neglect they were subject to and are interested in meeting their mother for the first time. "She will never have unsupervised visits," said Sandra. "We have worked too hard to get the kids in a good place." One of the main takeaways from the Flynn’s case is that while addiction is guaranteed to take everyone and everything from a person, recovery cannot guarantee that you will get back everything you lost. But that is not an excuse to keep dying in living addiction. One can still have a role in their child's life, even if they do not see or regain custody of their children. What's more, there are no certainties in life. Wounds can heal, living amends can be made. And there is just no telling what blessings working an honest program of recovery will bestow upon those willing to take the steps. One need only sit in a 12-step meeting to hear about the miracles of recovery. If your life has been turned upside down by opioid addiction, please contact Hope by The Sea. Recovery is the hardest journey you will ever take, but it is also the most important one you will ever set upon.